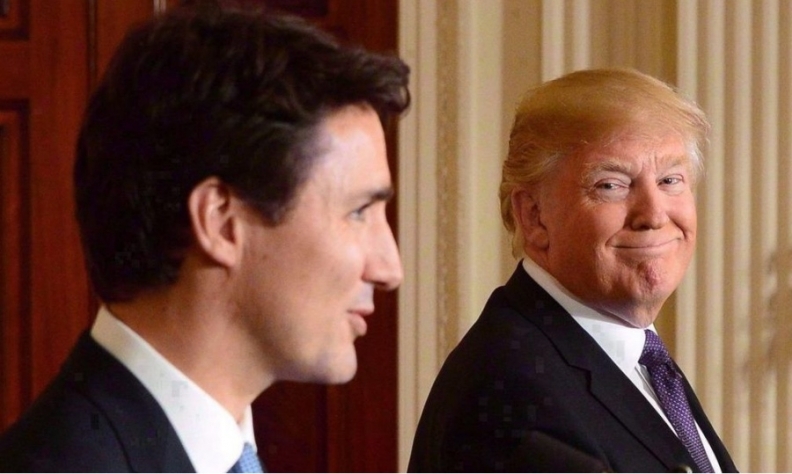 U.S. President Donald Trump, right, is "seriously contemplating" separate trade deals with Canada and Mexico. OTTAWA — The Canadian government is rejecting a push by the Trump administration to strike separate, bilateral trade deals with Canada and Mexico instead of pushing ahead with a stalled effort to renegotiate the North American Free Trade Agreement. Ottawa's refusal to pursue a one-on-one trade deal with the United States comes after Donald Trump's top economic adviser said the president was serious about pursuing bilateral agreements with its NAFTA partners. "He is very seriously contemplating kind of a shift in the NAFTA negotiations," Larry Kudlow, director of Trump's National Economic Council, said Tuesday on the Fox News program "Fox and Friends." "His preference now — and he asked me to convey this — is to actually negotiate with Mexico and Canada separately. He prefers bilateral negotiations and he's looking at two much different countries." Kudlow also said he relayed Trump's message to a senior member of the Prime Minister Justin Trudeau's office. The remarks are likely to create more cross-border economic uncertainty with the U.S. after Trump imposed stinging steel and aluminum tariffs on imports from Canada, Mexico and Europe. But they landed with a thud in Ottawa, where several Trudeau cabinet ministers insisted Tuesday that Ottawa remains singularly focused on a three-country deal. "We want a trilateral agreement — we've always said this," said International Trade Minister Francois-Philippe Champagne. "We know it works, we know it underpins a very integrated supply chain. So, when you talk about this issue you have to look at reality — the reality is that over the last 24 years we have built a very integrated supply chain, which has been good for [the] economy, good for consumers, good for workers on all sides." The federal government also continued its outreach with top U.S. lawmakers on Tuesday. Foreign Affairs Minister Chrystia Freeland discussed trade and tariffs with key Republicans while she was in Washington for the general assembly of the Organization of American States, a Canadian government official said. She met with her counterpart, Secretary of State Mike Pompeo, as well as Sen. Bob Corker, the official said. On Friday, Trump floated the idea of negotiating separate bilateral trade pacts with Canada and Mexico. On Tuesday, Kudlow doubled down. Trump doesn't plan on withdrawing from NAFTA, but he wants to try a different approach, Kudlow said, adding that his boss "hates multilateral" treaties. "Canada is a different country than Mexico — they have different problems, and you know, he's believed that bilaterals have always been better," Kudlow said. "Now I know this is just three countries, but still, you know, oftentimes, when you have to compromise with a whole bunch of countries, you get the worst of the deals." The tariffs, meanwhile, have further complicated the U.S.-Canada relationship — as well as the effort by Canadian politicians of different stripes to appear united when they press Washington on trade issues. The topic led off debate Tuesday in the House of Commons, where Conservative Leader Andrew Scheer criticized the Liberals for announcing retaliatory tariffs that don't take effect until July 1 — a full month behind the U.S. measures. "The U.S. tariff on steel is affecting those workers today," said Scheer, who noted Canada's steel industry employs more than 23,000 workers and indirectly supports more than 100,000 jobs. "Why is the prime minister waiting ... to impose steel and aluminum countermeasures when those U.S. tariffs are in effect right now?" During their exchange, Public Safety Minister Ralph Goodale accused Scheer of focusing on partisanship rather than maintaining a common front against American trade belligerence. "Canada is fighting back to support Canadian workers and the businesses that employ them," Goodale said. "From coast to coast, a very strong Team Canada effort is pulling together, except apparently for the leader of the Opposition." After the U.S. announced it would impose the tariffs, a senior official told The Canadian Press that the chances of striking any deal on NAFTA — ever — had "just fallen through the floor." "The government commitment remains NAFTA," said one of several officials, all of whom spoke on condition of anonymity because of the sensitivity of negotiations and the ongoing efforts to manage relations with the U.S.
Trudeau and Mexican President Enrique Pena Nieto renewed their commitment to NAFTA last week after the tariffs were imposed. The two leaders "agreed to continue working toward a mutually beneficial outcome" on NAFTA, Trudeau's office said.